Last night, I witnessed both the best and the worst of Bristol at the same time. Just next to the luxurious Marriott Hotel on College Green were a group of people wearing fluorescent clothing, erecting sets of tables. Once the tables were in place, food started to appear, as did large numbers of homeless people to eat it. The contrast between the rich and the poor, the haves and have nots could not have been more distinct. Outside the Marriott, men in smart suits and women in stunning dresses were heading out for an evening of wining and dining in Bristol’s wonderful harbourside area. A queue of top end makes of private hire vehicles snaked onto the main street. Meanwhile, passing them by, were the men who had literally nothing. I still do not understand for the life of me how we as a society tolerate the growing numbers of homeless people in our country. Not only do we tolerate homelessness, we vote for it. In electing the Tory government of 2010 in which some Lib Dems had jobs, plus the Tory governments of 2015 and 2017, the electorate looked at the prospective leaders and decided to go with the one who ones who had history in creating, by way of their policies, austerity and so homelessness. Everywhere, up and down the land, local councils as well as kind-hearted individuals and charities are stepping up to the plate. While others sit and moan on social networks – “why doesn’t someone else do something?” – people are getting their hands dirty, giving up their time and money to help the people society has either forgotten or doesn’t care about. 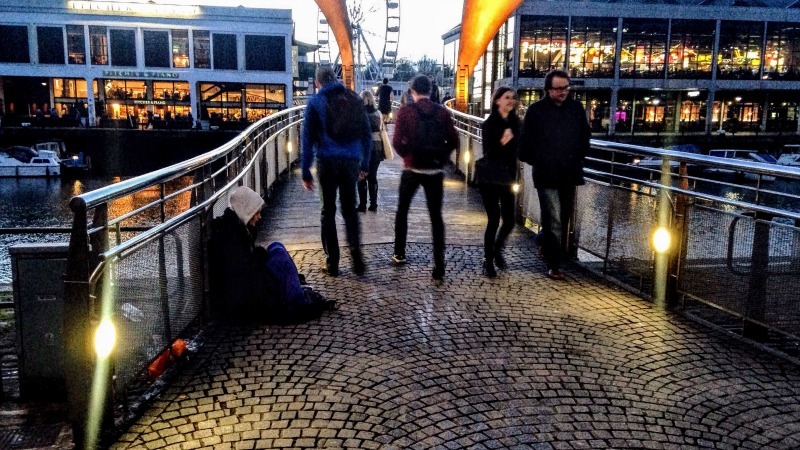 As I enjoyed myself in the crowded pubs of Bristol, I kept reminding myself of how lucky I was and that I must do more, in all kinds of ways, to help those who cannot help themselves. This is an unequal country in so many ways and what I saw last night was an illustration of just how bad the inequality actually is.